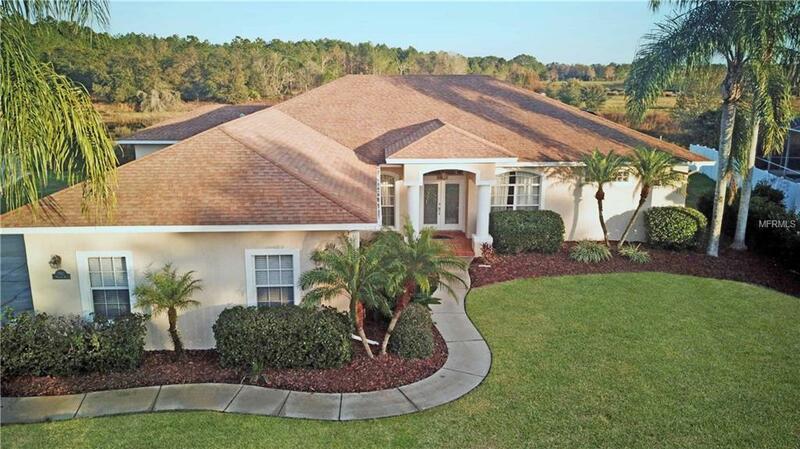 Looking for a stunning home with plenty of room to stretch out? This 3 bedroom, 3 bath, 4 car garage custom build in the Yorkshire subdivision of Sherwood Forest in North Lakelandcould be the perfect fit. The home has a separate living room, dining room and office/den along with a bonus room. This property backs up to a peaceful conservation area which you can see from the pool in your screened lanai. This lanaiis also plumbed and has 110/ 220 electric, perfectly prepped for an outdoor kitchen.Fantasticbeveled leaded glass front doors lead into a large tiled foyer. Youll love the high ceilings throughout the house that give an airy and light feeling, highlighted in areas of the home with additional tray ceilings. French doors open from the foyer to the formal dining room and study. The gorgeous custom cooks kitchen features 42-inchsolid maple cabinets with granite counter tops, stainless steel appliances, a gas stove, under cabinet lighting, a walk-in pantry, prep sink, and disposal! There is an eat-in nook and breakfast bar for casual dining orentertaining. The master suite has a large en suite bath with solid cabinetry, double vanities, a large tiled walk-in shower, and separate walk-in in closets. You can watch the wildlife from the lanai and your private backyard.